Tri-Cast are very proud to launch for the 2014 season the latest two rods in the discerning Trilogy Rod Range. We have the new TRILOGY X4 SPECIALIST FEEDER RODS, a version at 10ft to 11ft , and the longer version of 11ft to 12ft 4 , to be used where a longer distance cast is required. These feeder rods are both a Swing tip and Multi Quiver tip rod. They have been especially designed for the dedicated Feeder angler when they are fishing for the likes of Bream, Skimmer Bream and Roach etc on Stillwater�s of all sizes and slow to medium flowing Rivers. Each of these models has a full Parabolic action with progressive power in the middle sections. 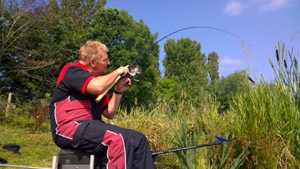 With a softer forgiving top section it allows the rod to absorb and cushion the heavy lunges of the bigger Bream. 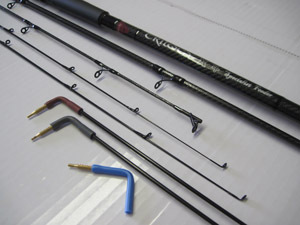 Each rod comes with two separate top sections so that every situation and conditions can be catered for. Firstly you have a Quiver tip section, which has 2 interchangeable Glass put over tips supplied with it. A 1oz and a 1.5oz tip. This section is the longer of the 2 sections supplied. The second and slightly shorter top section is a dedicated Swing Tip section and comes supplied complete with 2 Swing Tips. The first Swing Tip is 11 inches long and has a medium action rubber fitted. The second Swing Tip is a shorter Tip at 8 inches long with a Stiff rubber fitted. This shorter tip we call a Wind Beater as it is perfect to use when conditions are a little choppy and you need more control in the wind. We also supply with these tips an extra interchangeable rubber which is a Soft rubber for use when bites are delicate and you just need that more sensitive bite registration. So as you can see these rods are very versatile and cover numerous venues and conditions. They are also the only true Swing Tip rods in today�s angling market place. Easy to cast with, and the very best bite registration you can get. It goes without saying that all of Tri-Casts built in qualities are in these new models, with quality Guides and Fittings and manufactured to the very highest standards to give the angler year upon year of reliable service and outstanding value for money.